Sam Cha Reads "For Light, For Fire"
Sam Cha stopped by yesterday and gave a reading of his poem “For Light, For Fire,” which will appear in our next issue. You can listen to the recording here. 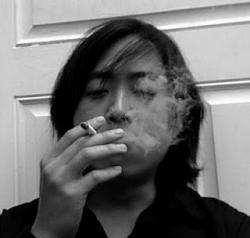 Sam Cha is an MFA candidate in poetry at UMass Boston, about to enter his third and ﬁnal year. Before he was an MFA candidate, he studied at Williams, UVA, and Rutgers. He was the winner of the 2011 Academy of American Poets Prize at UMass Boston (judged by Marilyn Chin). Also of the 2012 Academy of American Poets Prize at UMass Boston (judged by Martha Collins). Also, he was one of the recipients of the 2011 &NOW Awards. He’s been published (poems, essays, translations) in apt, anderbo, Opium Online, decomP, Radius, ASIA, and Amethyst Arsenic, among other places. And his favorite kind of pie’s a mud pie with a rope ladder baked into it—lockpicks and chisels on the side, hold the tin plates.